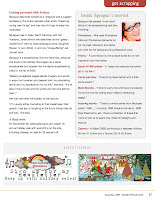 Editor's Note: The following article was published in the December 2009 issue of DST Insider, a publication of DigiShopTalk.com. Helping people become more comfortable using their computers and allowing them to record the stories of their lives continues to be a goal and passion for Jessica Sprague. 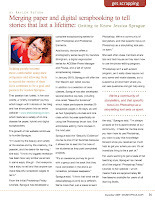 That passion has fueled, in her own words, a “pretty incredible” journey which began with tutorials on her blog and has since grown into an entire website – www.jessicasprague.com which features a variety of on-line classes for paper, hybrid and digital scrapbookers. The growth of her website continues to humble Sprague. From the initial Photoshop Friday tutorials, Sprague has developed a complete scrapbooking series for both Photoshop and Photoshop Elements. Additionally, the site offers a photography series taught by Candice Stringham, a digital organization series for ACDSee Photo Manager and Picasa, and a set of hybrid scrapbooking classes. In January 2010, Sprague will offer the first Wacom pen tablet course. In addition to a selection of core classes, Sprague has also developed several elective courses, including one called “Beautiful Evidence” which helps participants develop 20 scrapbook pages in 20 days, as well as two typography courses and one class which focuses specifically on using the Photoshop brush tool. She anticipates adding more courses in the next year. Sprague said the “Beautiful Evidence” course is one of her favorites because it allows her to see into the lives of her students as they post completed projects. She said often class members share tips and techniques as they learn how to use the photo-editing program. For users wanting to get a taste of her teaching style, Sprague has moved all of the original “Photoshop Friday” tutorials to her website – which means there are approximately 80 free lessons available for users of all learning levels. Sprague describes herself as a “dreamer and a juggler,” confessing that she’s happiest when she’s “dreaming up big new things” and has lots of things to keep her motivated. Sprague lives in Apex, North Carolina, with her husband, Jared (whom she describes as the “geeky mastermind” behind JessicaSprague.com), daughter, Rowen, 5, son, Elliott, 4, and one “longsuffering” cat named Jane. Sprague is a scrapbooker, first and foremost, because she loves to tell stories. She began as a paper scrapbooker and dipped into the digital scrapbooking world in the fall of 2005. Her kids are often the subject of her layouts. “I’m usually either marveling at their sweetness, their growth, their joy, or laughing at the funny things they do and say,” she said. On November 30, JessicaSprague.com began its annual holiday sale with everything on the site, including classes, on sale for 20 percent off. Jessica Sprague rocks! Run, don't walk, to sign up for ANY of her classes - you won't be disappointed! Taking Jessica's classes has truly changed my scrapbooking life! I am no longer intimidated by Photoshop. I have gotten so many more layouts done! Her teaching style is easygoing and her voice incredibly soothing and confidence instilling. Take a class...you won't regret it!